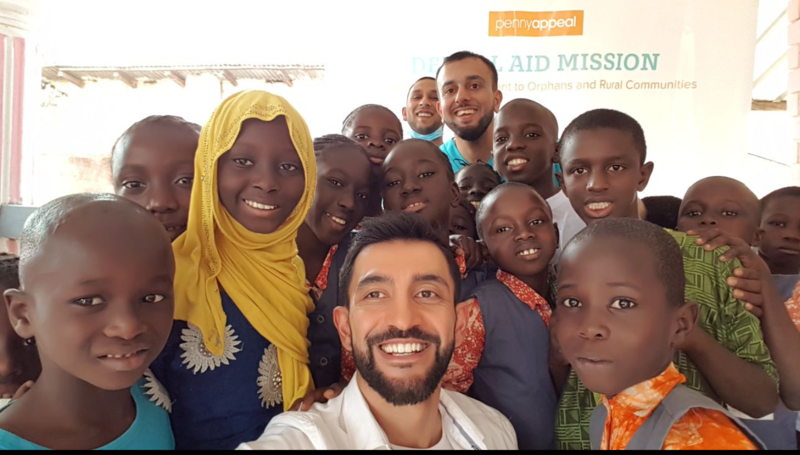 In 2018, a new opportunity arose for the charity to travel to Gambia, West Africa, to work with Penny Appeal, (a UK based charity), who have been providing orphan relief in countries across Asia, the Middle East and Africa since 2009. 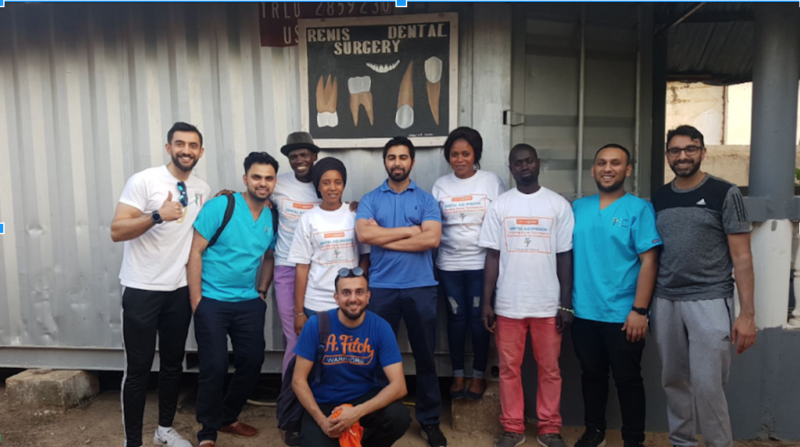 In total 6 dentists travelled from UK – 4 from Glasgow and 2 from Manchester for this new challenge.As this was our first trip to Gambia, our aim was mainly to target the orphanages set up by Penny Appeal and we also allocated a few days of the trip for treating adult patients from nearby villages. 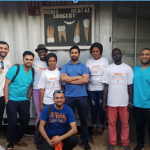 The clinic that we used during our trip was funded by a group of dentists from Germany who previously travelled to Gambia to provide emergency dental treatment. One local dentist currently uses the clinic providing basic dental treatment. The first two days were spent screening and treating the schools that work closely with Penny Appeal and have been set up for orphans. In total, approximately 400 children were screened with 103 in total requiring treatment, which was a combination of extractions and Hall Crown placement. The children requiring Hall Crowns attended the clinic a few days after separators were placed at the initial visit. The remaining 3 days were spent treating adult patients requiring emergency dental treatment. 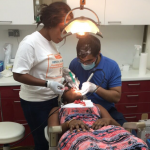 In total there were over 200 adult patients treated, travelling far from surrounding villages with many requiring multiple extractions due to the majority having never had access to dental care in the past. We aim to return to the same clinic for future years with a larger team aiming to provide a wider range of care for adult patients requiring treatment other than extractions as well as placing an emphasis on preventative care for the children in the schools we visited this year. 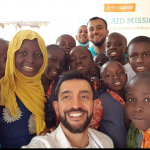 We have set our sights high for future trips and aim to expand our network of volunteers for the next trip as well including begin delivery of dental health promotion in the education programme of the local schools in Gambia. After a late arrival from a busy flight it was pleasant being welcomed into Sunday morning with the hot African sun. Nice early start at 8am discussing the logistics of the mission ahead over breakfast. We set off to the partner charity- Penny Appeal’s office to organise the equipment and finalise the plan for the week. Unfortunately, we ran into some difficulties as one of the shipments containing crucial dental equipment hadn’t arrived. We ended up splitting into two teams- myself, Saif, Bilal, Amer and Khuram set out to the schools to get started with the screening whilst Asid made the hour long drive to the clinic to assess and prepare the facilities and equipment. We started the screening at the first school setting up chairs in the gardens using the advantage of the sunlight. You could hear the excitement of all the kids from the classrooms- most had never seen a dentist before. It was a slow start but then a constant steady flow. A brief break and chicken baguette for lunch later and we were ready to travel to the second school. We had a huge welcome entering the second school with all the orphans running up to us and shaking our hands. It was incredible to see their smiling faces. By the end of the day we had screened over 380 orphans who all received toothbrushes, toothpastes and toys. It was a long tiring day but incredibly fulfilling especially towards the end when we were playing with all the kids and their new toys- especially the fidget spinners! We made it back to the hotel by sunset to meet with Asid, finalise the treatment plans and logistics of the clinics. Thankfully, there were enough instruments in the clinics for us to continue providing dental care however, we were hopeful the missing shipment would arrive in time for us to complete all that we had planned. An embarrassingly quick tournament of table tennis to complete the night ended very poorly for the Scots but there was still plenty of days left in the trip for a comeback. All in all a very productive and enjoyable first day in the smiling coast of Africa! Monday was the first day in the dental clinics in Darselami- an hours drive from our hotel in Serrakunda. We set off armed with forceps and plenty of insect repellant! It was all hands on deck as we brought back around 100 children who required treatment from the screening day previously. We decided to split the team up into separate rooms to be as efficient as possible. Asid, Amer and Bilal in one room, myself and Rofu in another (never a good idea) and Khurram in the only room with AC, suction and a light! Most of the children had never visited a dentist or had any treatment carried out before. Acclimatising them to a dental setting using lots of stickers and toys (mainly fidget spinners) was very useful! The children knew minimal English however we all managed to pick up some basic Mandinka phrases- creating our own Mandinglish dialect. A busy day full of extractions followed. The bravery of the Gambian children was incredible, and most coped with the treatment very well. 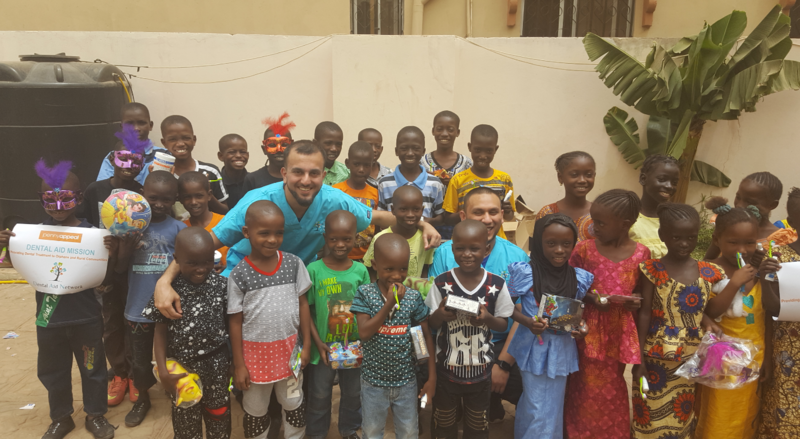 It was amazing knowing that for most of these children who were orphans it would be their only chance to visit a dentist and their only chance to remove teeth that could lead to further problems in the future. After a tiring day in clinic it was straight back to the hotel for some food and then straight to bed after some back stretches! We take a lot of things for granted including our access to healthcare. It’s hard to imagine a place where you have to wait weeks even months to have someone relieve you off your dental pain due to lack of funds or a lack of access to dental care. Taking a step back and looking at the bigger picture- we all have skills which we can use to help benefit those less fortunate than ourselves. DAN provides this platform for you and I can’t recommend highly enough getting involved with them. What’s better than giving back and getting to see a new part of the world – loved every minute! Tuesday was our first day holding an open clinic for adult patients. 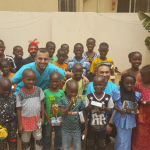 Our partner, Penny Appeal, had spread the word throughout Gambia. We all travelled to the Remis Dental Clinic with great anticipation and excitement for the day ahead! On arrival we were overwhelmed with the number of people waiting. Penny appeals advert had clearly worked well. There were patients from all over the surrounding villages waiting to be seen and even some all the way from Senegal. We had agreed between the team that we would try and see at least 60 patients. Similar to the day before we had the use of 3 rooms. Amer was our appointed oral surgeon who took on any difficult or surgical extractions in the only surgery onsite. Myself, Saif, Asid, Rofu and Khuram shared the 2 remaining rooms between us. It was a tough and testing day. The non existent AC, no suction, limited light/visibility and no dedicated nurse made almost every extraction challenging. Many patients were requiring multiple extractions. The highest number for one single patient being 13. Total number of extractions was 99 for the 60 patients seen. The evening was a time for reflection. This being my first dental aid mission it was difficult to see so many people in need for something we take for granted. So many patients who have suffered with pain abscesses etc and just had to deal with it due to financial reasons or lack of dental care available. We all like to moan about the NHS and it’s restrictions as dentists and patients but this experience has taught me how lucky we really are to have dental care on our door step. Day 4, so far so good with the first few days running smoothly but if Day 3 was anything to go by, we knew were in for a tough day! We had decided to split the team with Bilal and Khuram setting off for the orphan schools that we had screened earlier in the week in order to place separators in for the children we had planned to place Hall Crowns for a few days later. The remaining four (myself, Rofu, Asid and Saif) set off for the clinic in Darselami to see adult walk-ins as we did on Tuesday. We had originally planned for Wednesday to be a half-day. On arrival, with 60 patients already registered to be seen, we agreed a half-day was rather ambitious, and, as we had agreed to see everyone who registered taking into consideration the distance many of the adult walk-ins had travelled, we decided to stay on until the end of the day. With the fantastic help of the staff from both Penny Appeal and the hospital, we managed to see 62 patients in total with 120 extractions completed. Meanwhile, in Serrakunda, Bilal and Khuram managed to see all the children from the schools requiring separators as well delivering detailed preventative advice to the all the children in the schools. Additionally, they met with founder of the schools to discuss raising awareness for oral health into the schools and how implement oral health advice into the curriculum. 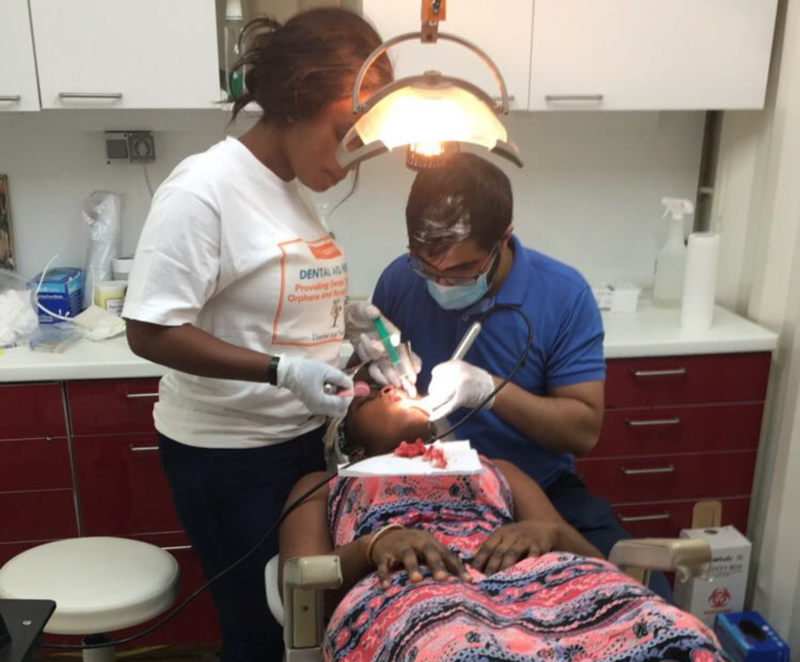 So far from this trip, it was apparent to all of us that there was a large need for regular dental access for a vast number of adults and children considering the amount of dental disease we had seen in the first 4 days and the distance many people had travelled for treatment. 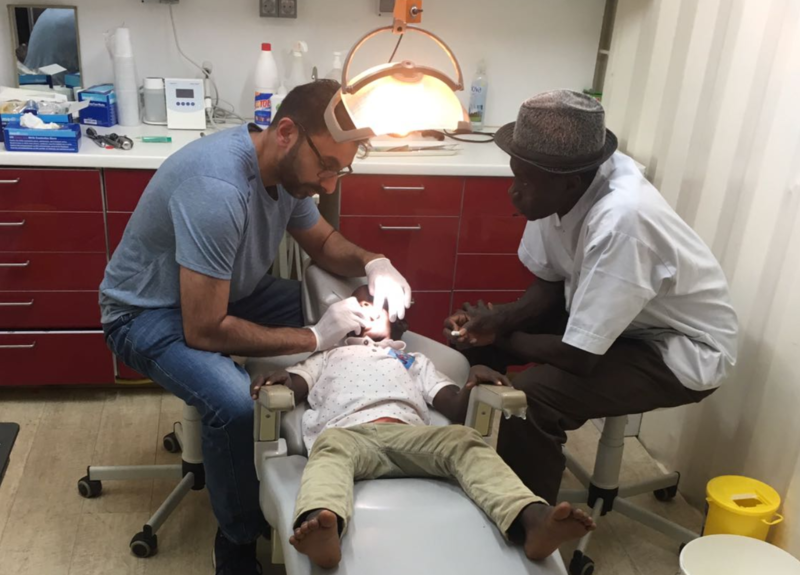 We were aware that the aim of this trip was mainly for pain relief for children in the schools we had visited and for adult patients that had either never had access/minimal access to dental care. At the end of the day we reflected on our experiences of the trip so far and if we had achieved what we had planned so far. We also discussed potential ideas for in terms of the types of treatments we could offer for future trips to Gambia. We finished of the evening with a few heated games of Mafia before calling it a night ready for a final day at the clinic! On the night preceding our final day of clinics, the team unanimously decided to place no limit on the amount of patients we would see – just keep working until every patient is seen. Prior to the mission, this decision would have seemed ludicrous, however after 4 days of encountering some of the poorest people we’ve ever met and the distances some were travelling to alleviate their toothache, our team, and anybody with any compassion, would have made the same decision. The drive to work in the morning was full of apprehension – predictions of 60, 70 , 100 patients being made. In the end on the final day we treated 117 patients – we treated everyone that came. A honourable achievement. Alhamdulillah. During the mission the team examined 582 patients. This included fitting 49 stainless steel crowns on orphaned children, extracting 428 teeth and placing 28 glass ionomer dressings. The team also gave oral hygiene instruction and dietary advice throughout the mission and in particular to over 380 children. 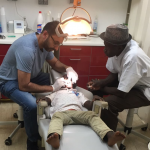 Dental Aid Network will return to The Gambia again to continue with its emergency dental care missions. Furthermore we hope to roll out an oral hygiene program through the Department of Education to all Gambian schools. The people of Gambia, from patients to the Gambian Dental Council have been incredible. Not only did they open their doors to us but opened their hearts when they welcomed the team to their country. This mission has not only had a measurable impact on the quality of life of the patients but also the DAN team, who are looking forward to their return to the smiling coast of Africa.